If you've ever spotted a green cocoon while taking a walk, you might have wondered what type of butterfly it holds. A cocoon, also called chrysalis, serves as a home for a butterfly while it changes from a caterpillar to a mature butterfly. The chrysalis protects the butterfly from predators and the elements while it undergoes the final stage in its development. 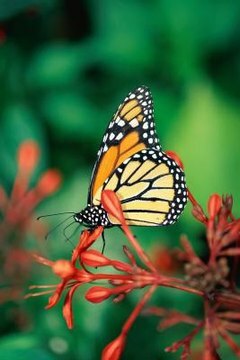 The monarch butterfly might be the most recognized butterfly to emerge from a green chrysalis, although butterflies throughout the world can create green chrysalises. This colorful butterfly has orange wings bordered in black with black veins. Two other black and orange butterflies that look similar to the monarch, the queen and viceroy butterflies, also spend time in a green chrysalis. Other types of butterflies that undergo the transformation from caterpillar to butterfly in a green chrysalis include the blue, spicebush swallowtail and white admiral butterflies. A female butterfly searches for a plant on which to lay eggs. The type of plant depends on the species. Monarch butterflies prefer milkweed plants, while spicebush swallowtail butterflies choose sassafras plants and white admiral butterflies pick honeysuckle plants. The female places one egg on the underside of a leaf and produces a special glue-like substance that keeps the egg from falling to the ground. A caterpillar, the larval form of the butterfly, emerges four or five days after the egg is laid and begins feeding on the leaf. A caterpillar forms a chrysalis by attaching itself to a branch with silk it spins from its spinneret, a sort of built-in spinning machine located on its lip. The caterpillar dangles from the branch head first and molts, shedding its old skin over its body. The new skin forms the chrysalis that covers the caterpillar’s body. When the skin hardens, it takes on a green color. The color helps the chrysalis blend in with vegetation, which makes it less noticeable to passing birds and other predators. The caterpillar remains in the chrysalis for approximately 10 to 14 days. During the last day, the chrysalis becomes transparent, and the coloring of the butterfly inside can be seen. When the adult butterfly breaks free of the chrysalis, it can’t fly until it dries and its wings inflate. Butterflies obtain nutrition by sucking nectar from flowers and other plants. As the weather turns cold, monarch butterflies in the U.S. and Canada begin the journey to Southern California and Mexico, where they spend the winter. Other butterflies, including the spicebush swallowtail, don't migrate and spend the winter in a chrysalis. The spicebush swallowtail chrysalis changes to brown to blend in with the winter vegetation.